Will it print through my multi-page forms? Will it print where I want it to on my form? Can the printer work automatically? How does DocuClock keep set to the correct time? Does DocuClock work with computers not running Windows? Can I run DocuClock over my LAN? What are the different ways I can use DocuClock? What connections do I need to make to get DocuClock up and running? Due to the implementation of OATS laws requiring traders to stamp their trades within three seconds of the Atomic Clock at the NIST, DocuClock has become a trustworthy and essential tool for many securities firms, large and small, across the United States. Whether a firm has one trader or 100, DocuClock is up to the challenge, providing customized date/time stamps with an accuracy of within one second of the Atomic Clock. DocuClock is especially attractive to cost-conscious traders because the alternative to having its own date/time validator is using an expensive clearing house or using the BRASS system which costs several thousand dollars per month. DocuClock stacks up against all competition in accuracy, features and durability (a life of more than one million stamps), and blows most OATS-compliant systems out of the water on price. Some of our competitors' systems start at over $2000! DocuClock software is started. The DocuClock print is turned on. When the program starts, the DocuClock software opens the printer connection through the printer port. When a slip of paper is introduced to the printer, it triggers the optical paper sensor. If the Automatic Sense mode is enabled in the DocuClock software, then the printer gets the exact time from the computer. It prints the time, a message, and text as set up in the DocuClock program - all fields are configurable. No keys or input needed on the computer for DocuClock to print. After printing the slip, the slip is ejected from the printer and DocuClock is reset and ready for the next slip. DocuClock has a rugged dot-matrix impact print head. It will print through most multi-page carbon and carbonless form sets. The accuracy of DocuClock depends on the computer's clock. ClockWatch software (optional) should be installed if you want to synchronization you computer's clock with the atomic clock. Accuracy with ClockWatch software installed can be +/- 1 second from UTC. More information on DocuClock accuracy and specifications. 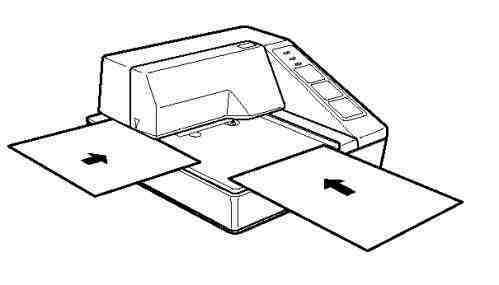 If the Automatic sense mode is enabled, then a slip is printed whenever a paper is introduced to the printer. No key presses or computer input is necessary. To print in the automatic mode the DocuClock program must be running on the computer. How does the ClockWatch time sync software work with DocuClock? ClockWatch software set your computers clock to the atomic clock over the Internet. ClockWatch Pro is included with DocuClock. More information on using ClockWatch with DocuClock. DocuClock Software runs on computers running Windows 95/98/Me/NT/2000/XP/2003/Vista/Win7/8. It will currently not work on other platforms. Unpack and install the printer, attaching the power supply. Attach the cable from the printer to the computer. Note the computer port used. Install the DocuClock program on the computer. Press the Time Stamp button to print manually. Select "Auto" to use the built in electric eyes in the print head. You can customize message, time stamp, and print options in the options menu.